Southern Colour Print is a New Zealand Company specialised in the secure printing of stamps, books etc. 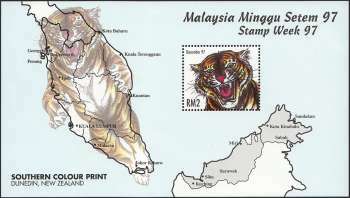 They were present at the 1997 stamp week, on invitation by Pos Malaysia, to demonstrate the printing of MS. Thus, this was the design that they had come out. Very limited quantity of this miniature sheet were noted.